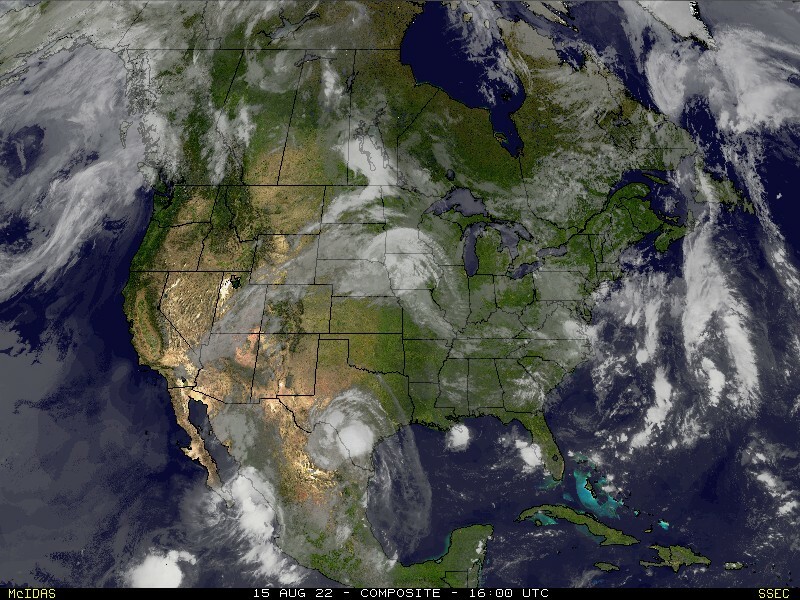 You will want to turn on your NOAA weather radio before you go to bed tonight. 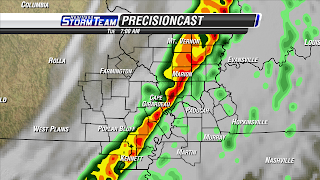 All indications are pointing to a pretty good chance of a line of strong storms passing through southeast Missouri, southern Illinois, and western Kentucky early Tuesday morning. I am thinking we could see the line begin to move in to some of the western counties of southeast Missouri starting sometime after 3:00am CT. 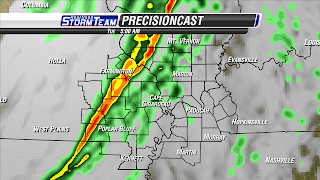 The line should exit the eastern counties of the KFVS viewing area by late morning. 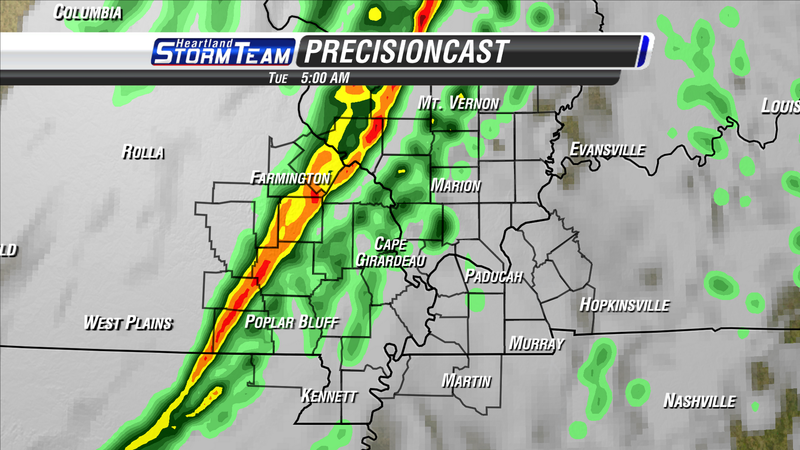 Here are a couple of images from our latest high-resolution Precisioncast model that you see on television. 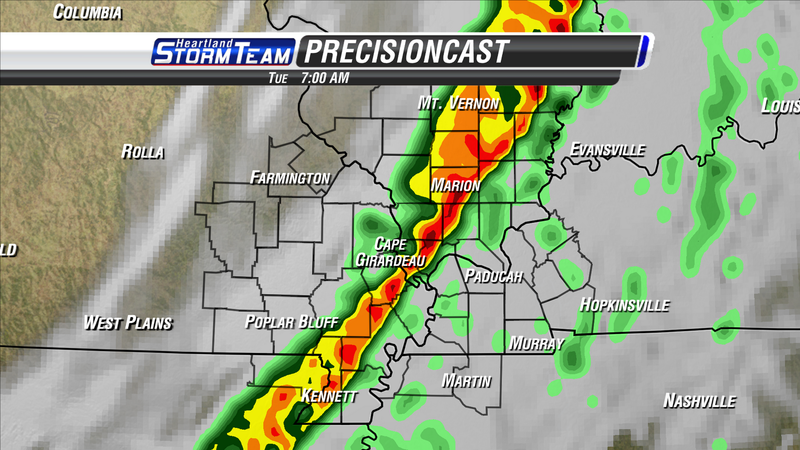 I think the main threat will be damaging winds from the line of storms. Winds will be sustained at 30mph through the early morning. At 1,000 feet up in the atmosphere winds will be racing at 60 mph. At 2,000 feet up in the atmosphere the winds will be racing at 70 mph. At 13,000 feet up in the atmosphere winds will be racing at 105 mph. A few of the thunderstorms could bring down some of that wind to the surface. Hence the damaging wind threat from the storms. Also, there will be enough turn in the atmosphere to allow for a few quick spin up tornadoes along the line. That is something additional we will have to be looking for. The Storm Prediction Center has a "Slight Risk" of severe weather for the KFVS viewing area for tomorrow morning. The official outlooks only go until 7am so that is why it is bundled between their Day 1 and Day 2 Outlooks. For family and friends in Indiana and Ohio, the SPC has upgraded parts of Indiana and Ohio to a Moderate Risk of severe weather Tuesday. I think the main threat for you will also be damaging wind and a few short lived tornadoes.